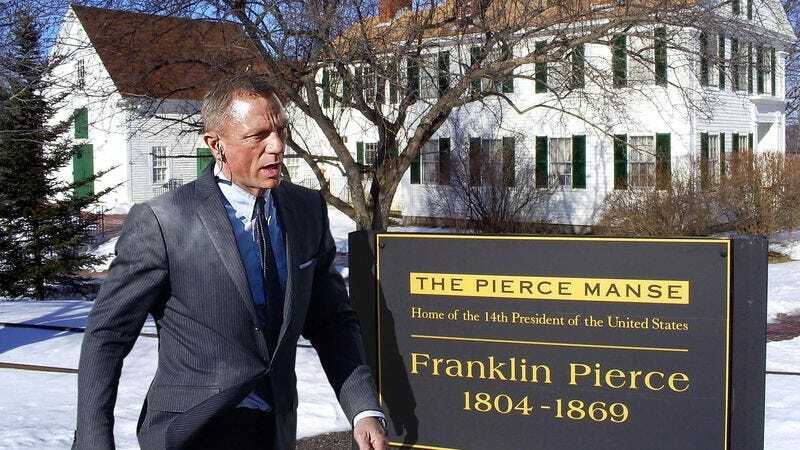 NEW YORK—Reacting with a mixture of surprise and disappointment, fans of the James Bond series voiced concern Thursday after learning that all of the latest installment’s shooting locations would be in New Hampshire. “A Bond film is known for its exotic locales, so I get a little nervous when I read about Sam Mendes securing the rights to shoot in downtown Concord and scouting covered bridges for the opening action sequence,” said fan Peter Harris of the series’ 24th film, which will reportedly feature 007 tracking a shadowy terrorist organization through conservation centers, hiking trails, and craft museums throughout the rural state, culminating in a final confrontation at the Franklin Pierce Homestead. “Sure, the clip of Daniel Craig emerging from a tiny submersible onto a beach at Lake Winnipesaukee is vintage Bond, but it’s going to feel kind of lame and static unless they at least whisk us off to a maple farm in Vermont.” Fans were also reportedly divided over the decision to change the name of the film from Spectre to Live Free Or Die.